The origin of the presence of brown bears in Abruzzo and surrounding areas is still to be unr avelled, but under faunal and bio-geographical viewpoints the Marsican bear cannot be considered just as a “post-glacial” relict derived from Alpine populations coming down the Italian peninsula along the Apennines. In fact, the first today available genetic and molecular data say that this species is likely of eastern Balkan origin. All the Italic pre-Roman populations who lived in Abruzzo, mainly a mountainous territory, were used to hunt bears. 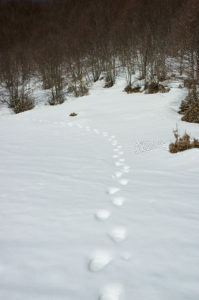 There are sources (Tarquinio, 2001) that report this hunting activity and the particular use of bear furs by Vestini, Marrucini, Peligni and Frentani. The same information concerned the Cicolano mountain side, inhabited by Aequi and Umbri tribes. Later writing evidences of bears in Abruzzo date back to 15th century. In 18th century there were many testimonies including geographical indications. The bear presence was reported in Sulmona, on the Salviano mountains (Avezzano), in the surroundings of Scanno, on the Teramo side of Gran Sasso, in the Matese forests, on Majella near Roccamorice and in Roveto valley, bordering the Papal State. Then, between late ‘700 and early ‘800, Giustiniani published his work on the Kingdom of Naples, whereon several information about the presence of bears on the Abruzzo mountains were reported. In that, it is stated that the plantigrade was signalled in the territories of Accumoli, Bisegna, Cagnano, Capistrello, Cappadocia, Colli di Macine (Chieti), Collelongo, Forcella, Gioia dei Marsi, Leonessa (Rieti), Monte Sabinese, Masellara (Chieti), Ortucchio, Pennapiedimonte, Pereto, Pescasseroli, Pettorano, Pizzoli, Tagliacozzo, Trasacco and Villavallelonga. In practice, bears were reported within a kind of crescent whose two points were Accumoli, at the furthest northern limit of the Kingdom, and the eastern side of Majella between Pennapiedimonte and Palombaro, but with two areas of particular concentration: the mountains over the high Liri valley from Tagliacozzo to Capistrello and the mountains that surround the south banks of Fucino. Additional reports taken from official documents of the interested communes arrived from the forest on Morrone between Popoli and Sulmona, from Salle, Gamberale, Caramanico, Carsoli, Civita d’Antino and from all those villages today comprised in PNALM (National Park of Abruzzo, Lazio and Molise). So we get to 20th century. The first pseudo-scientific study on the bear of those lands, in which the difference between Ursus Arctos and Ursus Arctos Marsicanus is highlighted, dates back to 1921. Its author, Giuseppe Altobello, published the same year in Campobasso his fundamental work on Abruzzo and Molise fauna, dedicating the fourth volume to carnivores, category wherein our bear appears. That year the association “Pro Montibus” hired 500 hectares in Fondillo valley, first core of a territory where the bear could not be hunted anymore, only after a special authorization from the association for eventual serious damages to local cattle and crops, and killing bear cubs was forbidden at all times. Then, in 1922, it occurred the official opening of Abruzzo National Park and in the following year, 1923, the Royal Decree sanctioned its institution.